As soon as we saw spy shots of a suspicious-looking prototype testing, we knew the next-generation Chevrolet Volt wasn’t far out. We didn’t expect Chevrolet to suddenly reveal that the car will make its debut at the 2015 North International Auto Show in Detroit, though. Chevrolet says the 2016 Volt will “build on the award-winning original’s strong foundation of technology innovation,” which may hint that a similar combination of gasoline generator and electric drive is in order for the new car. The new Volt should also build upon the 40-mile all-electric range of the current car, bringing it to around 50 or 60 miles. 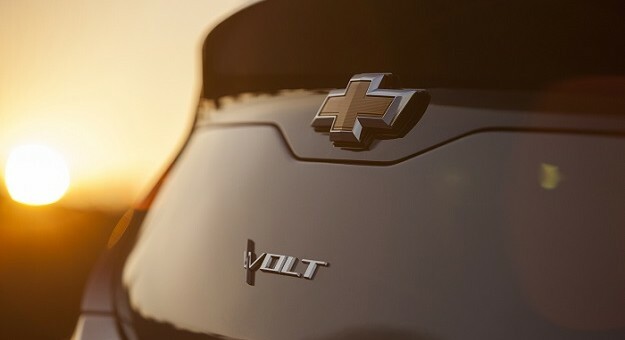 No information on the 2016 Volt was revealed by Chevrolet, save for a small teaser image of its new back end. We’re expecting it to have improved efficiency and range and most importantly, a smaller a pricetag. We’ll have to wait until January to find out. The 2016 Volt is the car that I’m most excited for! A 50-60 mile range sounds like an amazing improvement. I do hope that they use Opel’s 1.0t I3 for a total output of around 195HP and 300LB-FT. The key here is weight and drag coefficient. I am really confused as to what platform they are using. Is it riding on the same Delta ll, will it go on the D2XX, or on a specialized platform for these Voltec vehicles? Very exciting news! Looking forward to a substantially more refined car. It will be interesting to see what advances the engineers have been able to make. GM is lagging against the competition. Real people drive CUVs, wagons, and pickups every day. Where are the Voltec or BEV versions? Dang, some day I’ll be a real person. Don’t listen to him. He thinks one of the pioneers of the contemporary EV are lagging behind the competition. I think you’re a helluva real person. They need an SUV or crossover. GM has no midsize SUVs since they dumped the trailblazer and since they chose to make the Colorado and Canyon harder to get into than the Silverado. I would buy a volt on a trailblazer frame in a second if they could just keep the size reasonable.